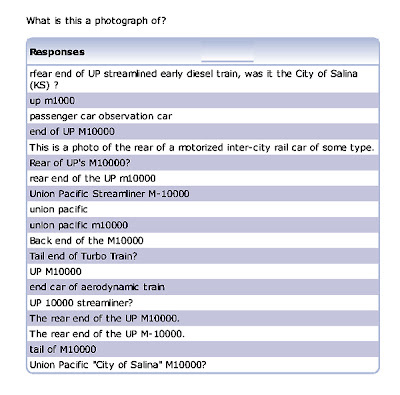 We had more than a dozen responses to our Rail Quiz #7. Those who guessed this is the stern of the M-10004 "City of San Francisco" were correct. 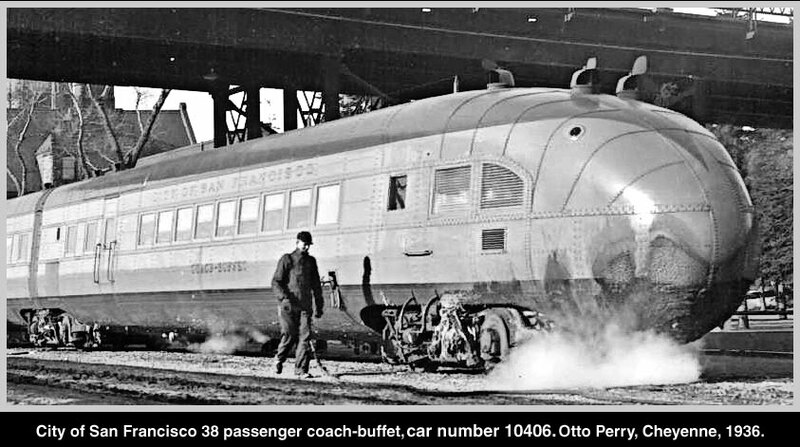 This is a 38-passenger "coach - buffet car." 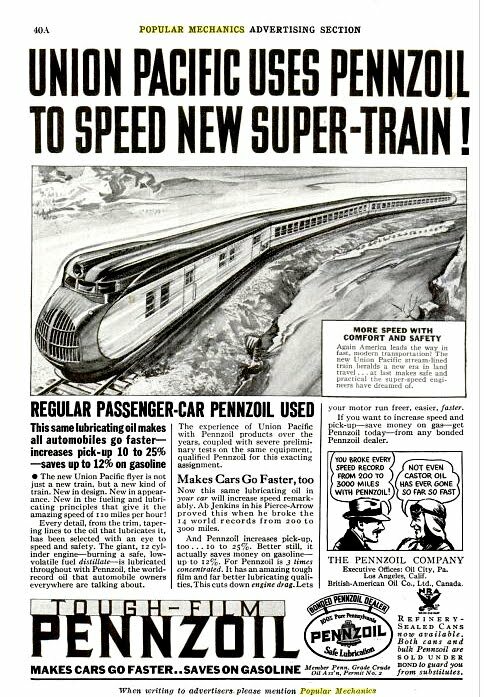 Union Pacific built ten of these remarkable radically designed lightweight high-speed trains, dubbed "streamliners." 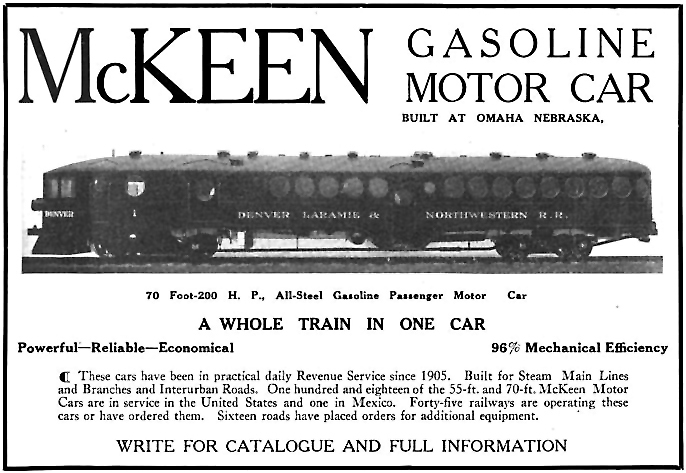 Manufactured by Pullman Car & Manufacturing, they were in a constant state of flux, as performance adjustments and improvements were incorporated. The bow of the "City of San Francisco" was likewise radical, with the automotive "radiator" motif. 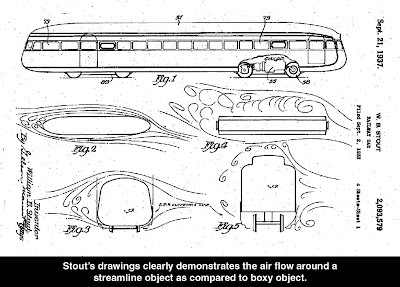 As I remarked in my recent article on the Gas Turbine-Electric Locomotive, Union Pacific exhibited "Big, Bold, and Brash" ideas for advancing railroad technology solving operating obstacles. 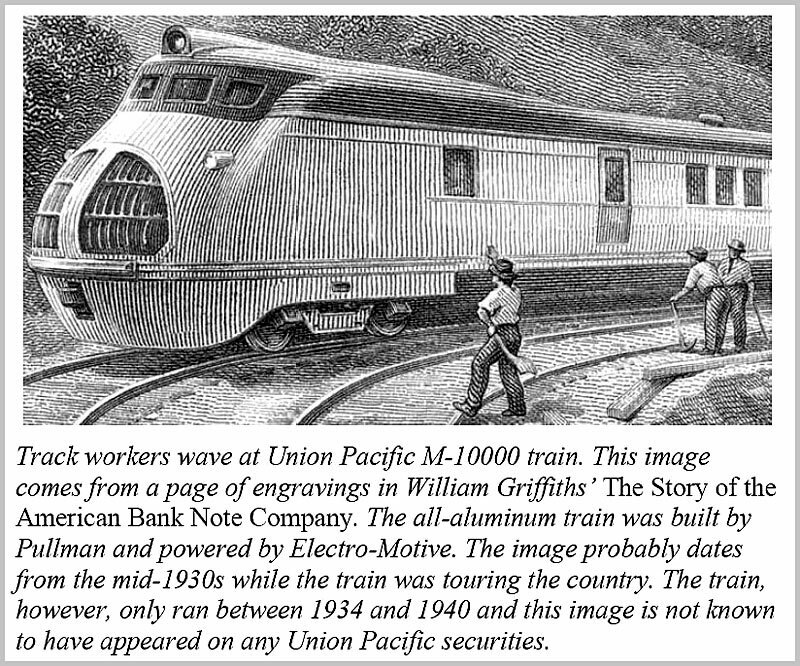 Facing a catastrophic loss of business during the Great Depression, Averell Harriman, Chairman of the Union Pacific, envisioned a streamlined train, made of lightweight material, sculpted for speed, using an internal combustion diesel engine rather than steam, to recapture travel by rail. 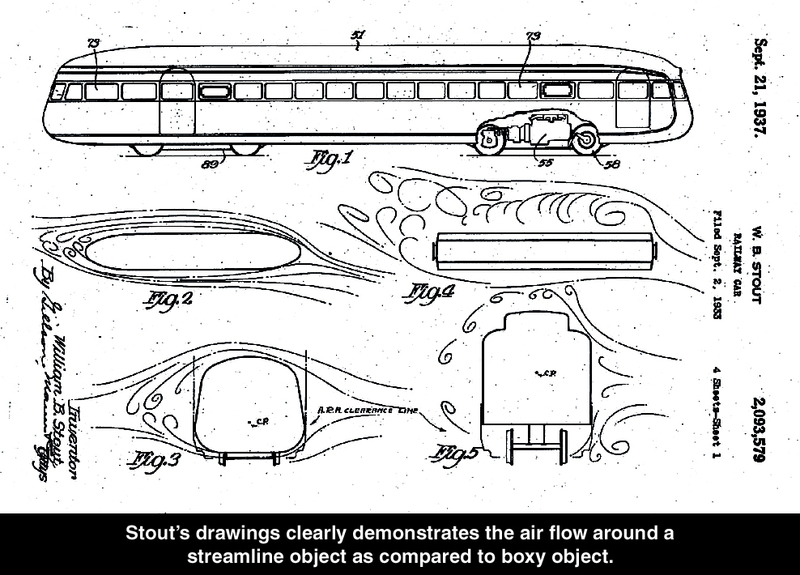 Meanwhile, to answer the need for short haul passenger locals, William Bushnell Stout, a noted aircraft engineer, had designed a radically streamlined rail vehicle for Pullman Car & Manufacturing. 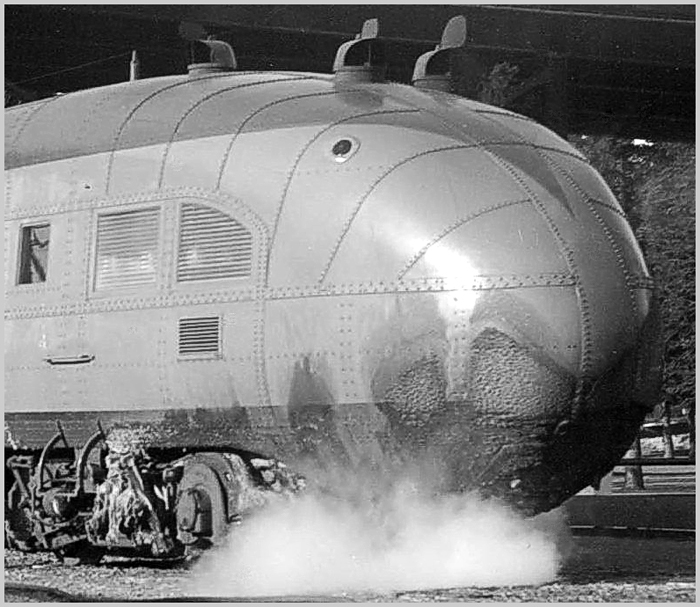 Looking similar to an airplane without wings or tail section, 50-passenger "Railplane" was constructed of chrome-molybdenum steel tubing and duralumin. Not to be confused with the British Railplane. 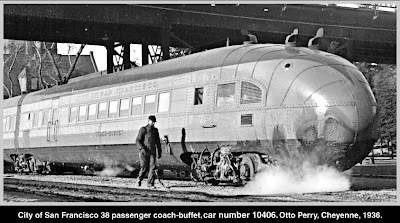 While the single car concept did not address Union Pacific's need for cross-country travel, its streamline design and lightweight construction techniques did appeal to the UP. 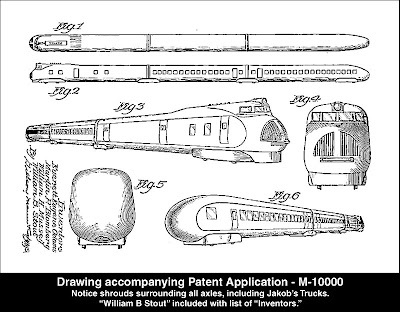 Hence, the "Railplane" became the base technology incorporated into the M-10000. The final design approval followed extensive wind tunnel testing at the University of Michigan. 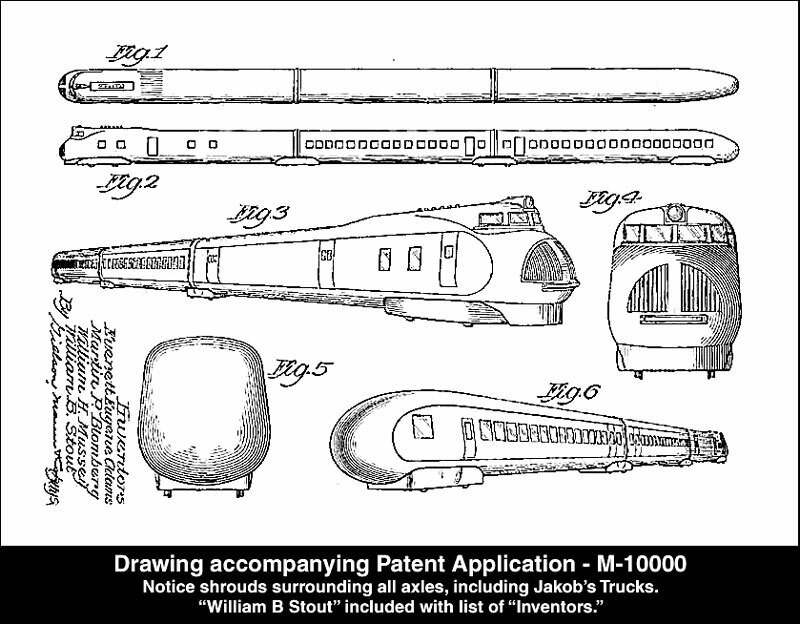 Indeed, both the "Railplane" and "M-10000" debuted at the Chicago Worlds Fair in 1933. Following the Chicago Worlds Fair, the "Railplane" went into service on the Gulf, Mobile & Northern. Following the 1933 Worlds Fair, and a cross country demonstration run, the M-10000 gained a forth car, a sleeper named "Overland Trail." 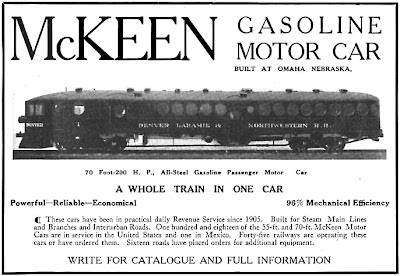 And the four-car streamliner, first in the USA, began revenue service as the "City of Salina." Consist of the "City of Salina:"
• The fourth car was a 2 x 2 56-passenger compartment plus a buffet. Food was distributed to passengers via a trolley mounted hot table. 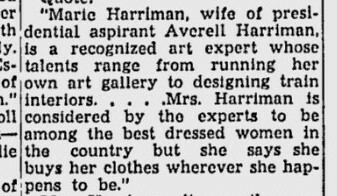 In addition to the futuristic design of the M-10000, Marie Harriman, wife of the CEO, designed the interiors. The train was unveiled in a startlingly new color - Amour Yellow, and brown. The only change made over time, was to replace the brown highlighting with Harbor Mist Gray. Just as Averell Harriman envisioned, the original three-car M-1000 configuration, some 204-feet long, weighed in at 85 tons! 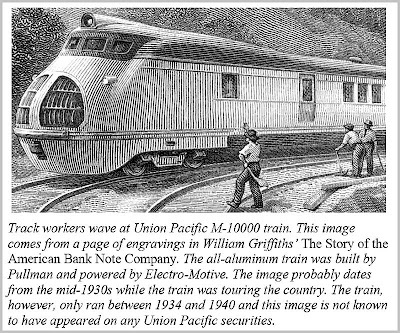 The entire lightweight train weighed less than a single steel Pullman car! 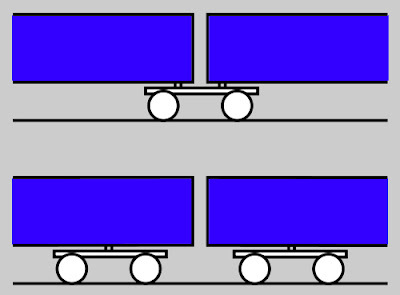 To further save weight, two cars shared a common bogie, using Jacob's trucks. Jacob's trucks, named after Wilhelm Jakobs (1858-1942), a German railway engineer, eliminated the weight of a wheel set per car over the length of the train. The principle is in common use to this day. On many occasions, the "City of Salina" would arrive from Chicago in Kansas City with 250 souls aboard a train with seating for 112! Standing in isles or sitting on each other's laps, they were obviously bound and determined to ride the new lightweight train of the future! 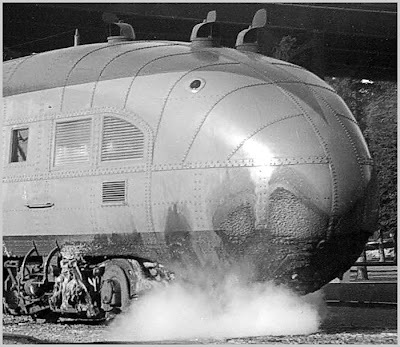 Nicknamed the "Tin Worm" or "Little Zip," the M-10000 "City of Salina" was scrapped in Omaha in 1942, contributing her aluminum to wartime aircraft production. 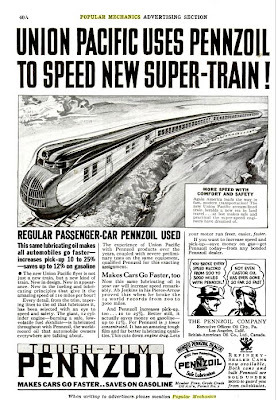 Successive "City" streamliners were increased in length from three cars, including the power car, to 11 cars, with a corresponding increase in power packs. On October 22, 1934, the M-10001 departed Los Angeles for New York. It arrived in New York in 55 hours and 56 minutes. 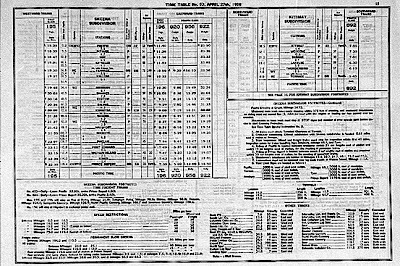 Union Pacific's "Big, Bold, Brash," lightweight train had beaten, by 14.4 hours, the previous steam train record, cutting by more than a day, cross country travel. But, like a vulture circling overhead, a new threat to passenger service. In April 1935, a Trans World Airlines (TWA) DC-2 set a transcontinental speed record covering the distance from Los Angles to New York, to New York in 11 hours and five minutes. 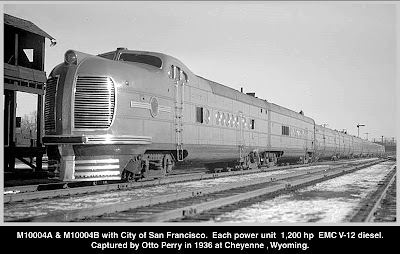 Don Strack, in UtahRails.com, presents a comprehensive history of the "City" streamliners. And additional details here. In switching over to Daylight Saving Time, I am reminded of the routine updates of Employee Time Tables. 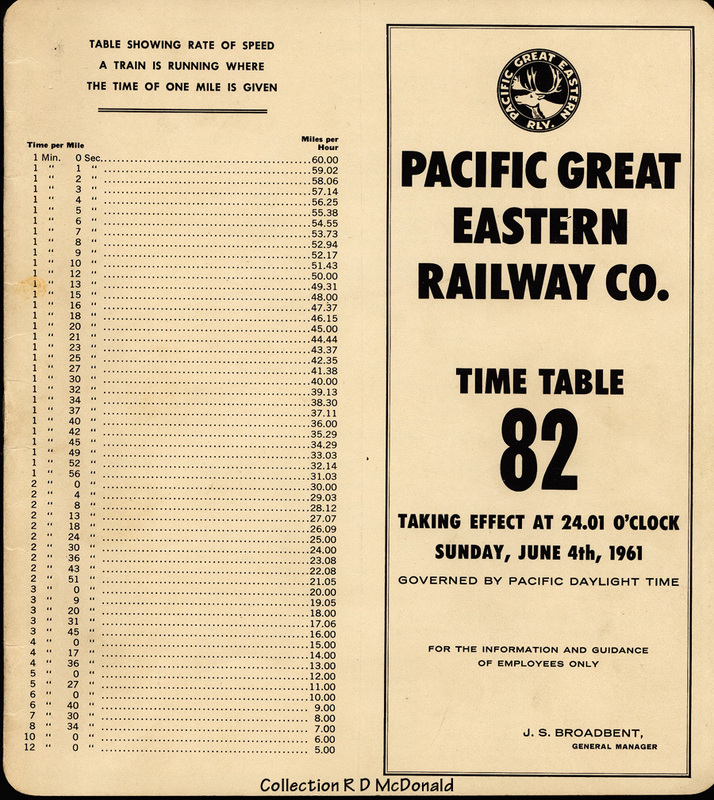 "Destroy All Former Time Tables" was printed on the cover of all Employee Time Tables, except Pacific Great Eastern, along with the date and time the publication became effective. 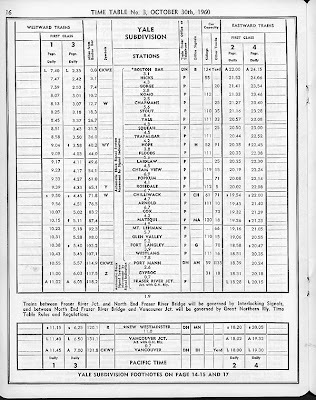 Employee Time Tables contained the raw materials necessary for the safe navigation from point A to point B, as opposed to Public Time Tables, filled with illustrations and sales banter. 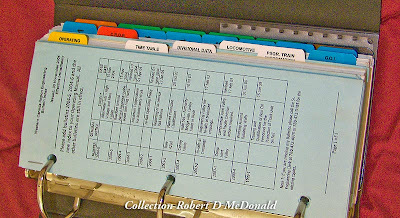 Employee Time Tables are printed in a wide variety of sizes. 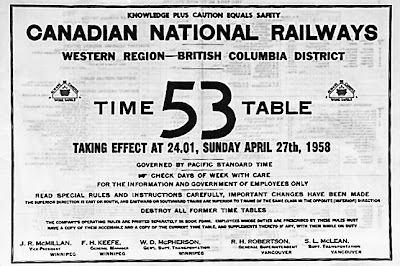 For years both Canadian National Railways and Canadian Pacific Railway, for example, printed in an unwieldy 11” x 16”. 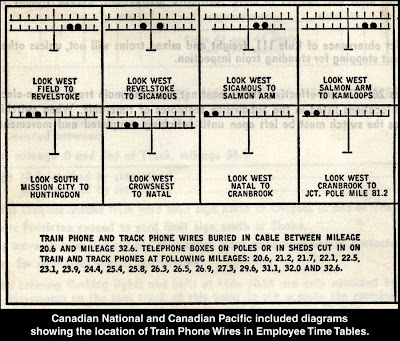 Finally in 1960, CNR and CPR switched to a more widely accepted 8.5” x 11”. Reading an Employee Time Table may at first seem dull and robotic. But dig a little further, and one can gain an appreciation for territory the railroad passes through. 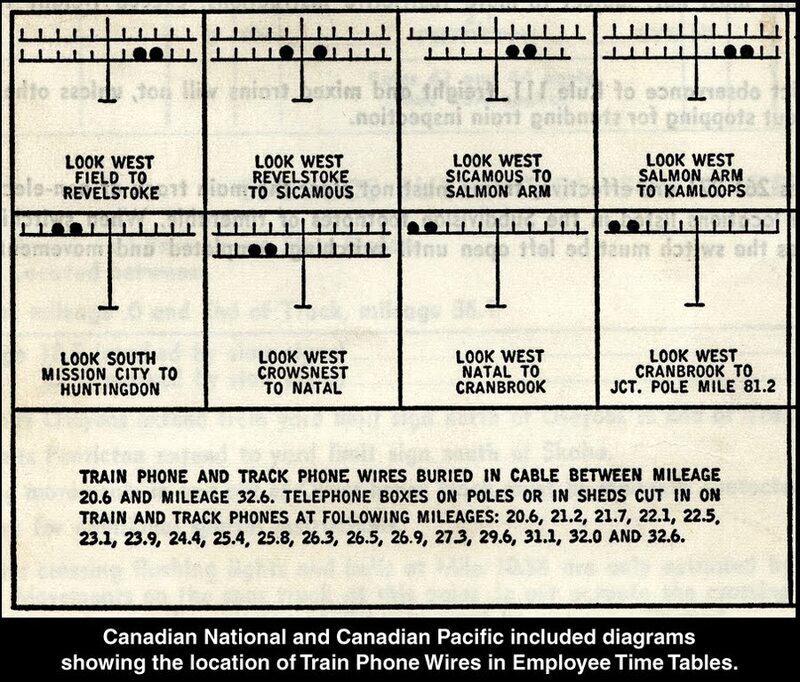 Usually broken down into operating divisions and subdivision, the main purpose is to indicate the arrival and departure times for various classes of trains and mileages between stations. Digging deeper, we can glean the car capacity of various siding, businesses and industries located along the line, along with their car capacity, an a variety of operating information such a speed restrictions, permanent slow locations, and important restricted clearance. 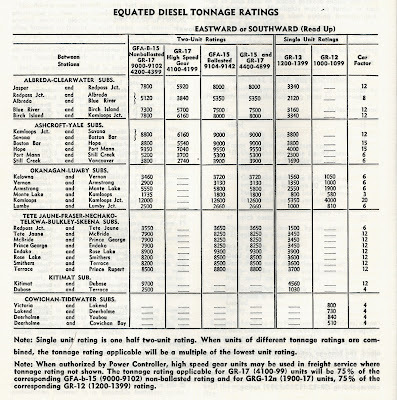 Others include the ubiquitous “speed table” and Tonnage Ratings for different classes of locomotives. 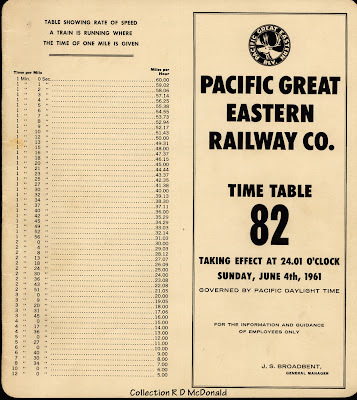 Not only was this Southern Pacific time table an unusual size of 4” x 11” (for fitting into bib overalls?) 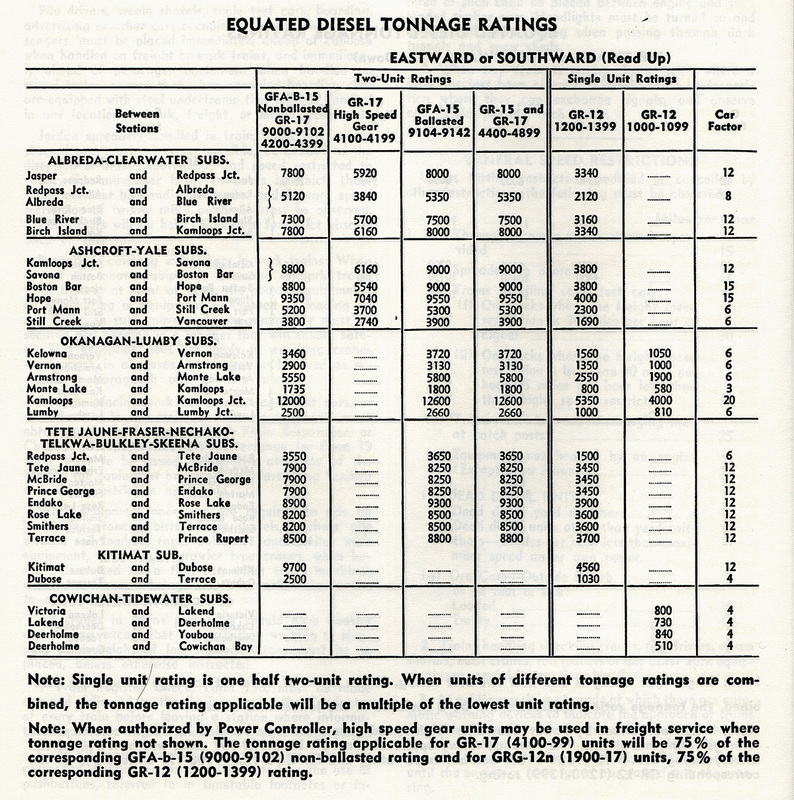 but it also included track profiles for the various divisions. 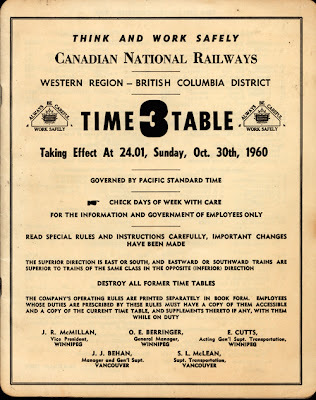 So now we get to a 2005 copy of the Canadian National Operating Manual, which includes employee time tables. This is obviously not going to be carried in a bib overall pocket, measuring 113/4" x 9" x 3" thick! 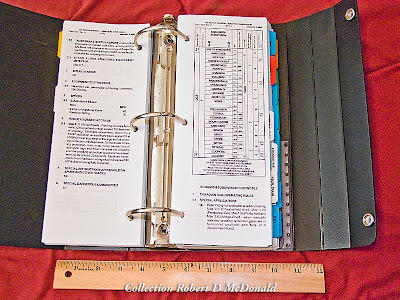 The volume is encased in a hard plastic binder, which from my fiddling around with it, is unwieldy. But then, I'm not an operating crew member, so I can't intelligently speak to it's "user friendliness" on the job. While on the bulky side, it would seem to me that this approach is a vast improvement over the way things were done. 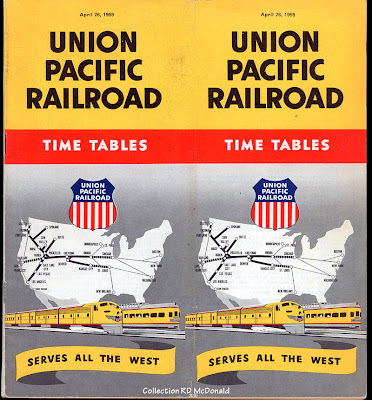 Many railroads issued "Special Rules" and "Operating Instructions" in separate publications. 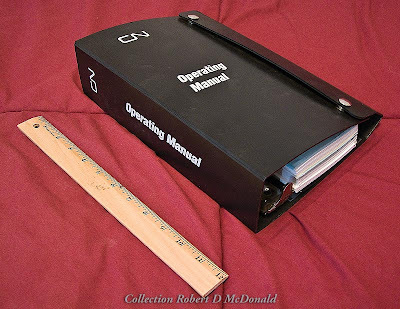 And Locomotive Operating Manuals in yet another publication. 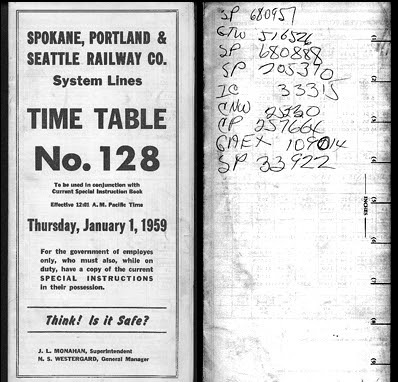 So as you can see, you can learn a lot about a railroad, by reading the information contained in the Employee Time Table. It can make for interesting reading! Somewhere in the past few days we hit a landmark of sorts - visitor number 200,000! We thank you for your continuing support of our more than 600 "feature" articles. Time for some fun! 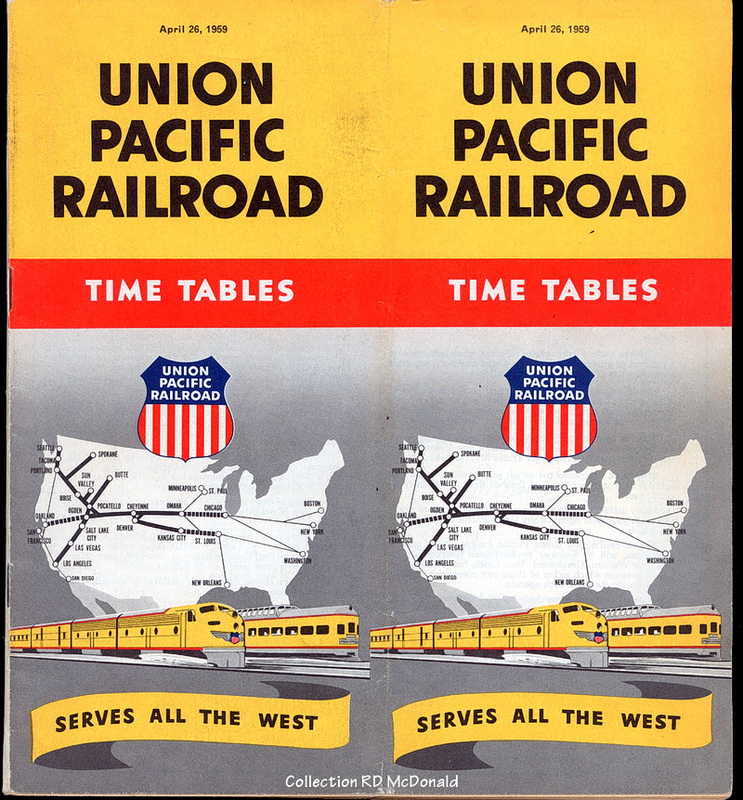 There are many things to admire about the Union Pacific Railroad (UP). 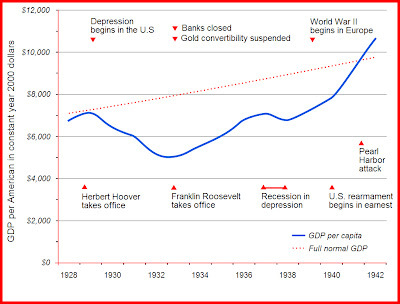 What comes to mind immediately was their boldness in designing and building big power. 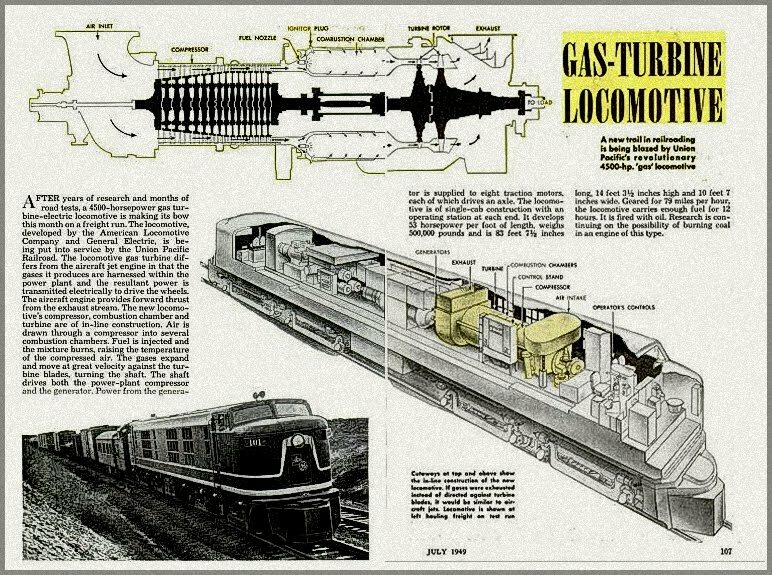 There was a period of time during the 1950's through 1960's, in which UP's Mechanical Department went all-out to develop high horsepower locomotives. This desire lead to the "Big Boy," the "Challenger," and in conjunction with General Motors, the "DDA40X Centennial." They dabbled in the diesel-hydraulics, and flip-flopped the radiator fan to give us the "Tunnel Motor." Big. Bold. Brash. I found in my collection, a group of three photos of UP's GTEL's - Gas Turbine-Electric Locomotives. As a mere lad of 15, more than a half century ago, I had been "trading photos" with correspondants found in the advertising section of Trains magazine. I have many "traders" from those days. That is how I got the photos. One propelled by a liquid. As found at your local hydroelectric project. 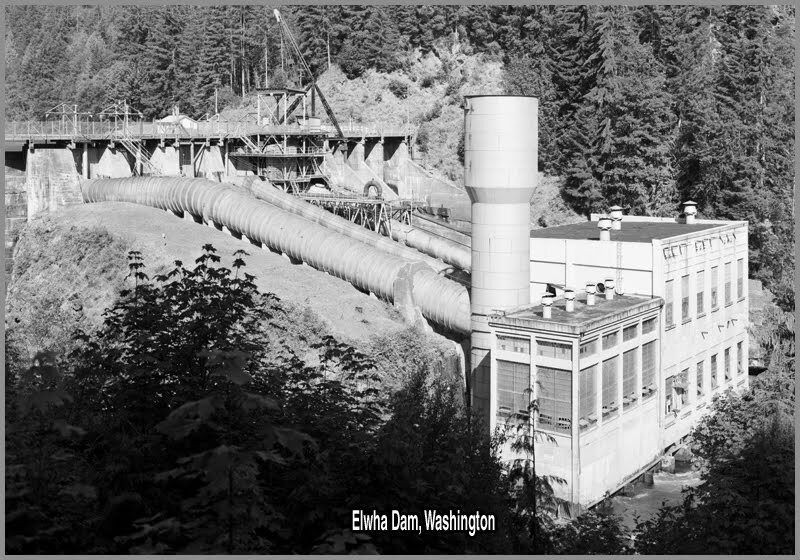 All that is required is a man-made lake and flumes to send the water against the turbine blades. Another driven by steam. This was the case with Chesapeake & Ohio's "Jawn Henry" locomotive. All that is required is a steam boiler to supply high-pressure steam against the turbine blades. 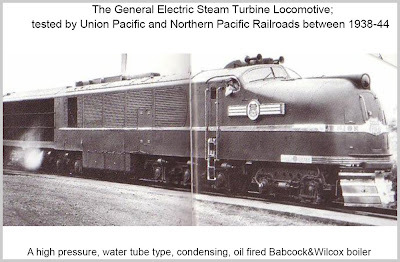 And the third type of turbine, driven by the combustion of burning fuel gasses against the turbine blades, as was found in Union Pacific locomotive. 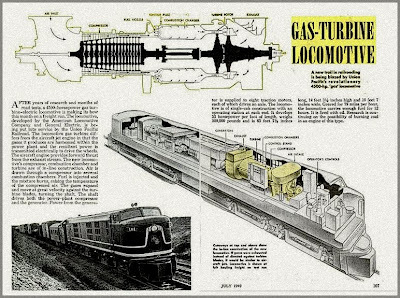 Developed first with Westinghouse, then with General Electric, the result was Union Pacific's audacious introduction of the GTEL - Gas Turbine-Electric Locomotive. 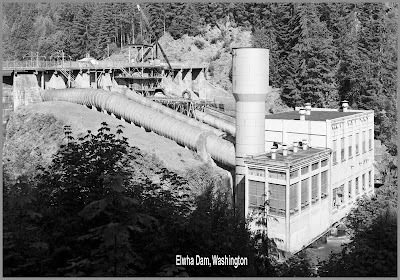 GE Stream Turbine, of which two were built and tested. GE 8,500 HP A+B sets, of which 30 were built. GE 4,500 HP double cab, one was built. GE 4,500 HP cab units. 10 built. 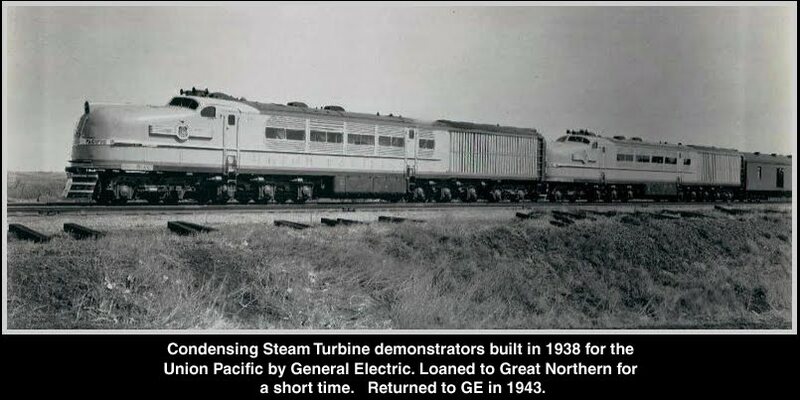 GE 4,500 HP "Veranda" units. 15 built. ALCo-GE Coal turbine, a monster A+B unit. "A" contained a 2,000 hp diesel "starter" and control cabinet for the 7,000 horsepower gas turbine housed in the "B" unit. 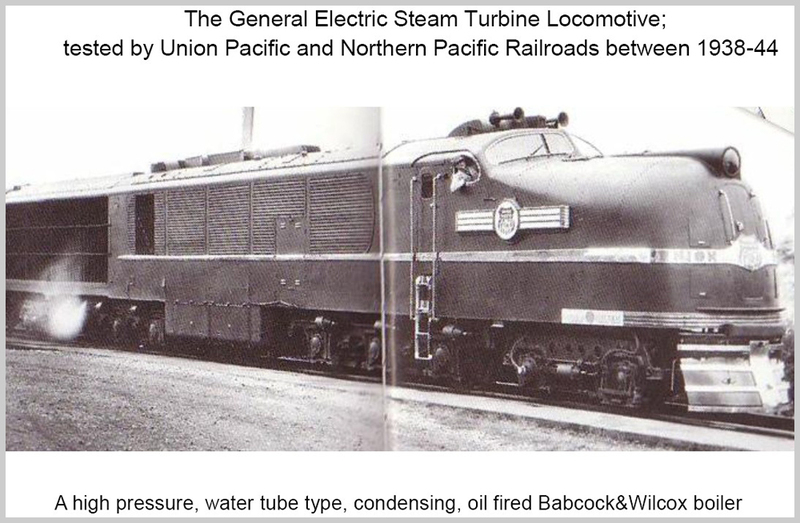 UP 80+80B ran on injected pulverized coal from October 1962 through May 1964. • Lead unit contains diesel engine used as a starter, and B unit contains gas turbine unit, with fuel carried in trailing tender. •Built February 1959, Serial Number 33205. • UP 52, B+B-B+B, 558,000 lbs. 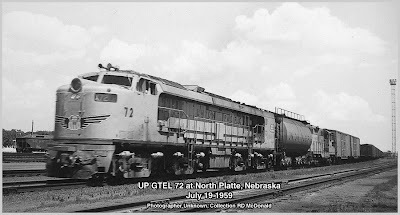 UP 61-75 single-cab 4,500 horsepower Gas Turbine locomotives were delivered without tenders. The tenders were added later by UP, rebuilt from FEF-1 class 4-8-4 (800-819) steam locomotive tenders. UP 61-75 were nicknamed "Veranda Turbines" because they were equipped with outside walkways along the sides of the car bodies. 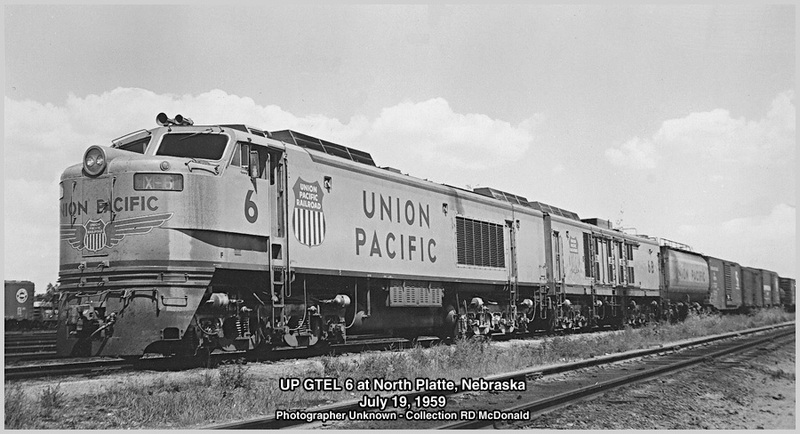 The truck and bolster assemblies from UP 61-68, 71-73, 75 (12 units) were reconditioned by UP at Omaha in 1963 and 1964 and shipped to GE-Erie for use on the U50s. The car bodies were scrapped by UP at Omaha and Cheyenne. 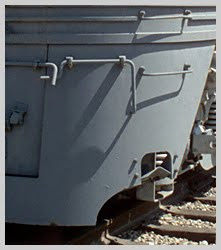 The truck and bolster assemblies from UP 69, 70, and 74 (three units) were reconditioned by UP at Omaha in 1964 and shipped to Alco-Schenectady for use on the C855s. The car bodies were scrapped by UP at Omaha and Cheyenne. UP 31-53 were built using reconditioned truck and bolster assemblies from UP's retired 4500 GTEL gas turbine-electric locomotives. 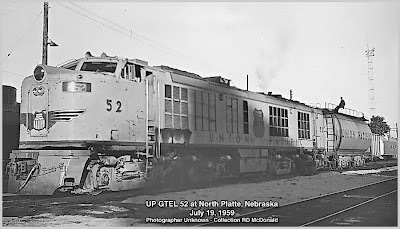 UP 52 was delivered rated at 5,600 horsepower as a field test of a Cummings PT improved fuel system. The modification was removed and the unit de-rated to 5000 horsepower in October 1966. Technical information on UP 6, 52 and 72, courtesy of Don Strack's UtahRails. Gas Turbines, as a class, are quite versatile. They can burn diesel fuel, Naphtha, light oil, pulverized coal dust, and even ground up peat! But the choice of fuel for Union Pacific was the so-called "Bunker C" fuel. "Bunker C" is not crude oil, but a residual after the "good stuff," like kerosene and gasoline, etc. have been removed from the crude. For a highly detailed explanation of Bunker C as a locomotive fuel, see Don Strack's UtahRails. While the gas turbine-electric locomotive has disappeared from American rails, over in Russia, this 11,130 horsepower unit recently completed testing, validating the brute's new world record for a single locomotive. In September 2011, the GT1-001 established a new record for a single locomotive, pulling 16,000 tons. By 1969, as fuel prices rose, the poor efficiency of the GTEL began bumping them off UP's Equipment Roster. Fortunately, two units were saved for history. UP 26 is housed at the Ogden Union Station, and the second, UP 18, is on display at the Illinois Railway Museum. 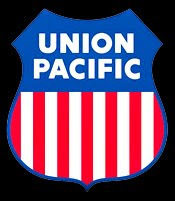 Union Pacific. The "Great Big Rolling Railroad!"